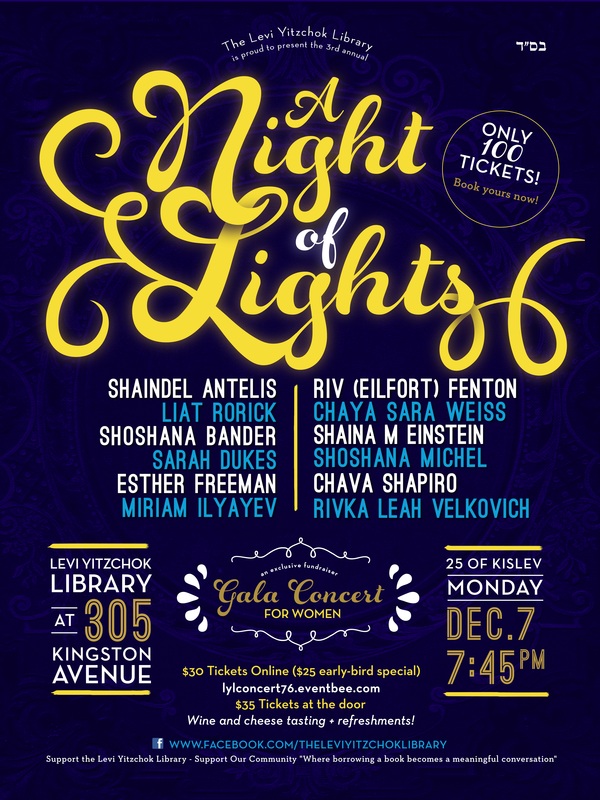 The Levi Yitzchok Library’s annual Night of Lights concert is back! The talented and exclusive cast this year includes Shoshana Michel, Shaindel Antelis, Chaya Sara Weiss, Rivka Leah Velkovich, Riv (Eilfort) Fenton, Liat Rorick, Sarah Dukes, Shaina Mushka Einstein, Esther Freeman, Chava Schapiro, Shoshana Bander, Miriam Ilyayev and more! Early bird discount tickets, $25, are available from Nov. 19 12:00 PM to Nov 26 10:00 PM. General admission tickets, $30, are available from Nov 19 01:30 PM to Dec 7 12:00 AM. VIP tickets, $50, are available from Nov 17 12:00 PM to Dec 7 12:00 AM.